We are in the parish of Costessey, pronounced Cossey, and it still has its village of Old Costessey, with a convincingly rural feel, despite the traffic. But the parish also includes a huge housing estate which is a suburb of Norwich along the Dereham road, and St Helen is a chapel of ease here to the medieval parish church in the village. In truth, the housing estate is rather dull and characterless, but St Helen is a fine looking building of 1975, in the vernacular style in red brick with tiled roofs. 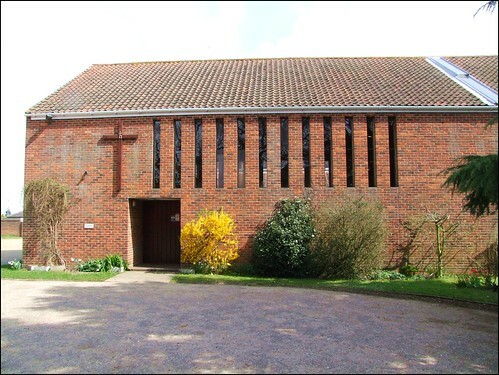 Behind the long body of the church there is a suite of parish rooms forming a large square. The effect is of a group of agricultural buildings. A large cross with a monogram of the church's patron Saint signals its purpose. Part of the success of the design is the use which was made of recycled bricks; they soften the overall effect. The architect was Andrew Anderson, and despite the starkness of the car park it is a peaceful spot in a busy world. As I stood there, a movement caught the corner of my eye. A robin hopped up from the low branches of a tree onto the gatepost of the adjacent cottage, and eyed me curiously. Suddenly, he broke out into song, and it was as if, for a moment, the mundanity of the Norwich suburbs had fallen away, and I was somewhere lost and timeless.